Miss Julia Bellevue has never been fond of high Society, and if possible Society is even less fond of Miss Julia Bellevue. Tales of her mother’s scandalous affair have made Julia an object of ridicule amongst the Ton for years and Julia would much prefer to be left out of their cruel games. But now Julia’s late father has secretly betrothed her to one of their number. The devilishly handsome Baron of Fawkland. A gentleman whose reputation is even worse than Julia’s own. Everyone says he is a terrible rake and a scoundrel, but if she refuses to marry The Baron she is to lose her inheritance! How could her father do this to her? 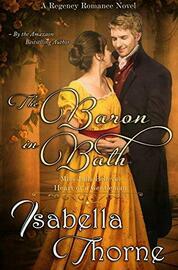 Julia must now travel to Bath for the summer to meet her unwanted intended, and his equally handsome brother.